As a state bigger than many European countries and with a tremendous amount of geographic diversity, California is a place tailor made for amazing road trips. In this guide, you’ll find that no matter where you end up, there is an incredibly scenic drive waiting to be discovered. If you are looking for more in-depth information on US trips, American travel blogs can be an invaluable resource to plan your trip. So without further adieu, here are some of the best scenic road trips in Calfornia. A timeless classic every road trip enthusiast should do in their lifetime, the Pacific Coast Highway contains some of the most dramatic coastal scenery in America. 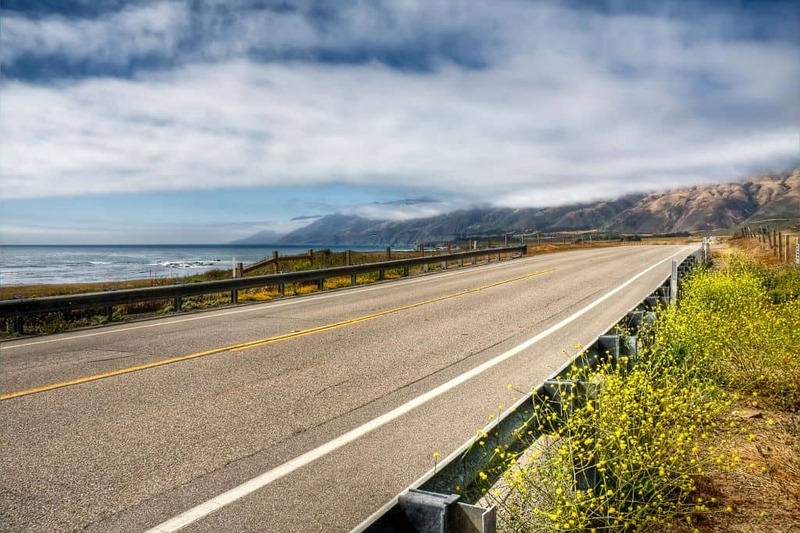 Commonly defined as the stretch of State Highway 1 lying between San Francisco and Los Angeles, some consider the entirety of the road, which starts in Northern California at Leggett and ends at Dana Point in Southern California, to be the proper route. If you are on a tight schedule, though, we’ll forgive you if you want to forego a time-consuming backtrack to the ‘official’ starting point. Instead, head south from the City by the Bay and make your way down to Santa Cruz. Boasting a boardwalk filled with midway attractions and a popular surfing beach, the entertainment options here will be an excellent way to end your day after a short but scenic drive along the PCH. Day two will take you to Monterrey, the Bixby Bridge, and the sea cliffs of Big Sur. While in Monterrey, check out its sea aquarium, which showcases aquatic life native to the region, as well as the sea lions which frequent its harbor. The third and final day will take in sights which include the Hearst Castle, the college town (and surfing hotbed) of San Luis Obispo, the Spanish colonial city of Santa Barbara, and the beach houses of glamorous Malibu. If you have time, sample a few wines while in Santa Barbara, as many oenophiles consider the region’s vino to be on par with what is produced in nearby Napa Valley. Among the most famous road trip routes in America, Route 66 is a highway which has captured the imagination of travellers around the world. While it goes all the way to Chicago, those wanting to travel back to the golden age of the automobile should still make time to drive the Californian portion of Route 66. Starting at the pier in Santa Monica, you’ll pass through the posh enclave of Beverly Hills and the suburban cities of the San Bernardino Valley (check out the Wigwam Village Motel while in the area) before entering the open, empty expanse of the Mojave Desert. Here, you’ll find several roadside attractions designed to grab the attention of tourists, with the Bottle Tree Ranch (made from wine and beer bottles affixed to steel poles) being one of the top highlights. Hungry for more of California’s scenic deserts? Stock up on water, slap on a sunhat and take a drive down the Death Valley Scenic Byway. Regularly logging some of the hottest temperatures in the United States through much of the year, it is best to visit this place during the winter months, or during the early morning hours in other seasons. Here, you’ll find mountains, rocky outcroppings, sand dunes, and wasteland in various stunning shades of orange, yellow, and beige. Hikers will love Mosaic Canyon, while the Ubehebe Crater will show you the humbling power of volcanism. Not all attractions here are related to nature, though – be sure to drop by Scotty’s Castle, a monument to humanity’s determination to live in even the most inhospitable landscapes on this planet. If your holiday plans include Northern California, ensure a drive on The Redwood Highway is in your plans. Starting at the Oregon border on US 199 before joining US 101 on the Pacific coast, it passes through famed Redwood groves like the Simpson-Reed Grove and Jedediah Smith Redwoods State Park before reaching Redwood National Park, the largest protected tract of land containing these giants in the world. There’s more to do on this route than attempt to hug impossibly large trees – along the way, you’ll also come across Crescent City, where some of the best beachcombing and whale watching opportunities in the state await.